THE TAOISEACH HAS said ‘oddballs’ wishing to send a message to politicians should not target their staff or families, after an envelope containing white powder was sent to the Department of Health. 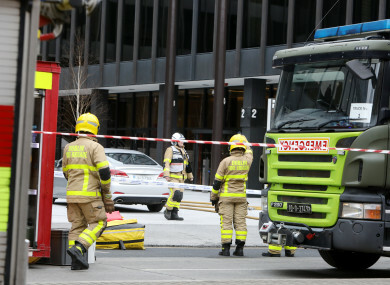 The building was evacuated after the envelope, which was addressed to Health Minister Simon Harris, was opened by a member of staff. Harris was in the building at the time but was not in the room when the envelope was opened. Technicians from the Defence Forces have since confirmed that the powder was non-hazardous. Reacting to the incident, Taoiseach Leo Varadkar said his concern is for the staff in the department who opened the mail. “I’m not sure what kind of oddballs send suspicious packages in the post but they should be well aware that it’s not the politician who’s going to be opening the mail, it’s somebody doing a normal job,” he told reporters. It could be a receptionist, it could be a security guard, it could be a clerical officer or somebody working on the constituency team and if you want to come after us, come after us, but don’t come after our staff or families. Minister Harris earlier thanked emergency services for their diligence in responding to the incident. He said it was a “difficult day” for his staff, particularly those working closely with him. The envelope has now been handed over to gardaí for their investigation. Email “Taoiseach on suspicious package: 'Come after us, don't come after our staff or families'”. Feedback on “Taoiseach on suspicious package: 'Come after us, don't come after our staff or families'”.